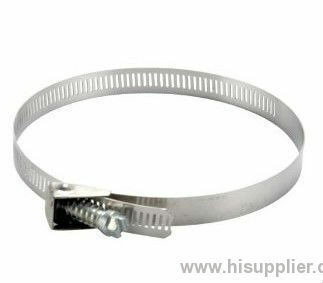 Hose clamps is hard and soft pipe joints and fasteners. Hose clamps solve hose clamps in existing technology for small diameter tubes in connection corner would appear, liquid and gas leakage problem, the hose clamps is open with bolts inside and outside the circle structure. The hose clamps can effectively solve the small diameter tubes in connection there was a blind Angle, and liquid and gas leakage problem, simple structure make easy to cost 30% of the original, the hose clamps is widely used in motor vehicles, petroleum chemical industry, pharmacy, food, brewery wastewater purification dust automobile fittings machinery fittings, etc.